e-CelticDocs is a simple online document management system designed for SMEs to back-up, search and manage your documents easily. 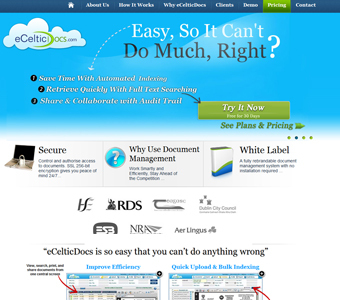 e-CelticDocs is a simple online document management system designed for SMEs to back-up, search and manage their documents easily.The SaaS based system allows businesses to reduce the complexity of administering a large amount of data. Accessing your files is made easy for colleagues, clients or suppliers who need secure access to vital information. e-Celticdocs offers a solid solution for improving communications and workflow while reducing costs. e-Celticdocs doesn’t require any software to be installed, which makes sharing documents with colleagues or clients hassle free. Documents can be managed on the go with remote access through Android, iPad, iPhone or wireless devices for search, reading or printing. With 24/7 support, this is a reliable system that can drive business efficiency. Implement a guaranteed data back-up and management system for your SME today.